Suspension hanging hammer plug-in screen-style pile-style piling recommended two-layer guide purlin, the beginning of the stage is usually used hanging hanging hammer to fight steel sheet piles, because this crane with a large range of hammer, in the need to adjust Pull out or lift the sheet pile. In addition, if the pile axis can be approached and the pile length does not exceed the working height of the mast, the guided-pile hammer can be used for the initial stage of piling. Temporary works to support the upper guide purlin, in order to ensure the support effect, should be higher than the bottom of the purlin at least one-third of the long pile, and the closer the pile the better. Fixed or telescopic guide bar when piling this method in the hammer and pile are usually guided by the guide, so the role of the upper purlin on the small. In spite of this, it is advisable to provide a rigid guide plate at the ground, and to prevent excessive bending of the sheet pile during piling and straightening. The guide bar must always be vertical so that the pile hammer can transfer energy through the center of the section. The plane of the pile must be straight, and it is easier to ensure straightness by using a suitable guide purlin than pulling the strip between the two wedges. The spacing between the guide beams is maintained by the positioning block in the form of a gap of about 10 mm for the height of the section of the sheet pile. 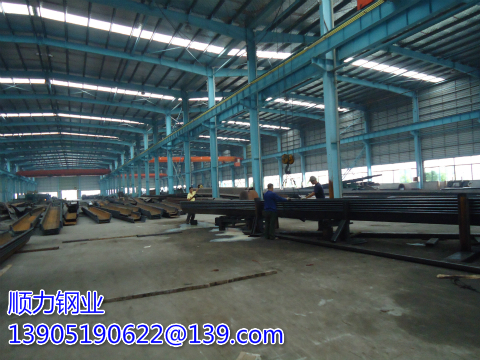 Therefore, if the use of PU piles, guided purlin spacing should be 450mm +10 mm = 460mm. When the piles are piled on, the guide members consisting of the bracket and the brackets shall be mounted on adjacent piles to prevent the frame from bulging. The wider the guide purlin apart, the more prone to rotation resulting in irregular pile wall, Larsen steel piling the scope of application of more difficult to piling.